The big event mid-June is the centenary on June 23 of Alan Turing, the mathematician, war-time code-breaker and computing pioneer whose life ended in tragedy in 1954. Many events are taking place across the world, and in Manchester we are running an historical walk looking back at his unusual life, taking in places associated with him in Chorlton-on-Medlock and central Manchester on his centenary, Saturday the 23rd, starting from the Manchester Museum reception at 11am. It’s an extraordinary story, laced with romance, invention, genius and scandal. Ed Glinert, the guide, will crack a few mathematical jokes, too. Alan Turing, born in London in 1912, was a maths prodigy as a boy. At the age of 14 his first day at Sherborne school coincided with the 1926 General Strike. So determined was he to attend, he biked it 60 miles to the school, stopping overnight at an inn. There he developed an interest in the latest mathematical philosophies, in particular Bertrand Russell’s paradox: “the set of all tea cups is not a member of itself, but the set of all non-tea cups is,” whose beautiful and simple resonance was so influential in the development of logic as a science. (If you’re interested further in this wonderful conundrum, press Glinert into divulging its precursor by George Cantor who “invented” infinity. Best to do it after the walk). At Cambridge University Turing developed the idea of a thinking electronic machine but lacked the parts to build one. 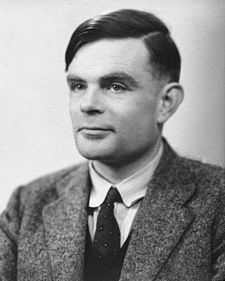 Manchester had succeeded (find out more on our Oxford Road/University/Science walks) and Turing helped extend the department’s knowledge of primitive computer technology, working in a small brick office on Coupland Street. It all went wrong for Turing in the 1950s after he picked up a boy outside the Regal Cinema on Oxford Street (now the Dancehouse Theatre) and took him home. The boy allegedly tried to blackmail Turing, and the mathematician went to the police. 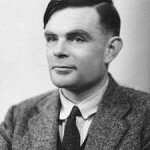 When they discovered that there had been a (then illegal) homosexual relationship between the two men they turned the tables on Turing and prosecuted him for gross indecency. His conviction led to the removal of his security clearance at a time of public anxiety about spies and homosexual entrapment by Soviet agents. He was forced to take hormones to “cure” him of his sexual leanings which made him grow breasts, and on 8 June 1954 Turing’s cleaner found him dead. The cause was established as cyanide poisoning. Did Alan Turing commit suicide, depressed about his career and life being in ruins, or was his death an accident brought on by failing to take care following one of his numerous chemical experiments? A further complication to the drama suggests that Turing was re-creating a scene from his favourite film, Snow White, and that he deliberately executed an ambiguous death to save his mother from too much embarrassment. Alan Turing was cremated at Woking; his life-size statue occupies pride of place in Sackville Park where we end the tour.